First I greased and lined my 9 inch cake tin. I started the mixture by creaming together 170g butter and 300g golden caster sugar. I then added 150g full fat natural yoghurt and mixed in. I whisked in 4 eggs, 1 tsp vanilla extract and 1 1/2 tsp rose water. Then folded in 300g self raising flour and 1 tsp baking powder. This was the rose water I used, I got it in a promotional pack, but I’ve seen rose water in Tesco and I think it’s quite easy to find. I baked on 180C/350F/Gas Mark 4 for 30 minutes, then turned down to 160C/325F/Gas Mark 3 for 20 minutes. It looked much better this time and no nasty crack, although I forgot to take a photo! Seen as I had ended up with two cakes I decided to decorate them both in different ways. It gave me a chance to be creative! I was sent these gorgeous pink chocolate cigarellos from the Chocolate Trading Company. They are the first company in the world to produce cigarellos in pink! Most of us have probably seen the white, milk and dark chocolate versions on wedding and birthday cakes before. I always think they produce a really stunning and elegant effect. EDIT: Unfortunately they no longer sell them anymore. 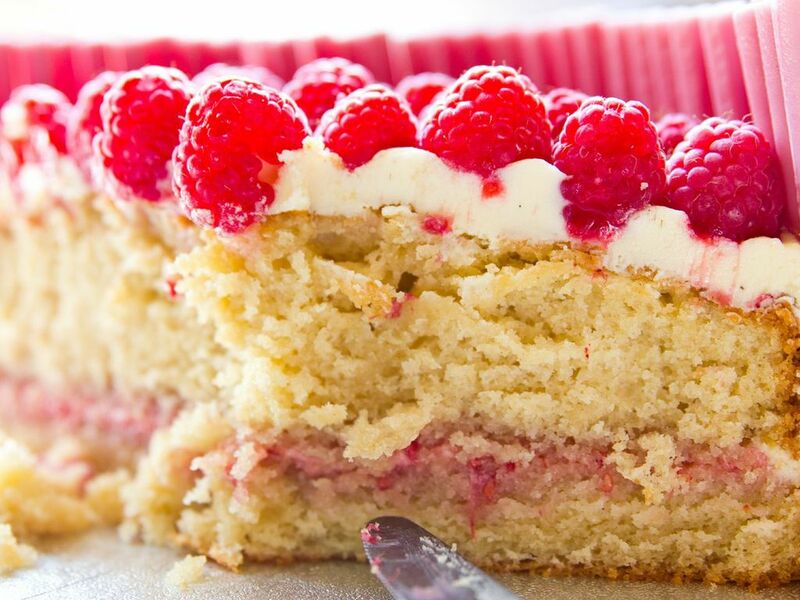 I cut the cake in half and made a raspberry buttercream for the filling by mashing up 10-12 raspberries, and mixing with 40g butter and 200g icing sugar. The cigarellos stick to a buttercream or ganache covering. I made a white chocolate buttercream by mixing 280g butter, 1 tsp vanilla extract and 350g icing sugar. Once it was smooth I mixed in 200g melted white chocolate that had cooled slightly. I covered the cake and began sticking the cigarellos around the side. They are very sturdy and stick upright easily. It’s best to do this on a cake board or the plate you will be serving the cake on. Moving cakes once decorated is difficult enough, but I wouldn’t advise moving one with cigarellos stuck to it as it could damage the position and appearance of them. Once the cake was covered I iced the top with the white chocolate buttercream. I added fresh raspberries, upright and in circles until the top was full, and then finished the cake with a pink ribbon. I am so pleased with how it looks! The pink cigarellos are really stunning and the red raspberries compliment the dusky pink chocolate perfectly. For the second cake I filled the middle with the white chocolate buttercream, then placed fresh raspberries flatly over the buttercream. For the topping I mixed together the leftover raspberry buttercream and white chocolate buttercream, I added 100g icing sugar to thicken it up and covered the top of the cake. I decorated the top with white and pink wafer roses, which I got off ebay. They are edible, and really delicate and pretty. They stuck easily to the buttercream and I arranged them haphazardly on top. I thought both cakes looked really good, I can’t decide which one I like best! I took them along to the afternoon tea so they could be eaten and enjoyed by the customers. I’ve heard that a picture of my cake may appear in a local newspaper covering the event…watch this space! I’m very excited and have my fingers crossed! These are the cute ‘taster’ cupcakes I made so I could tell you about the flavour of the cake as I wouldn’t be eating the cakes. They also showcase another way to use cigarellos. You can do more with them than place them around cakes. It sounds strange to have something flavoured with rose as it’s associated with soaps and other beauty products. But the flowery flavour is really delicious! It’s hard to describe, it’s like eating a nice smell – if that makes sense! The sponge was sweet and floral, the first bite is quite powerful but it becomes milder as you keep eating. Both the buttercreams were delicious and mixed together even better! The fresh raspberries compliment the delicate rose perfectly. The sponge was moist due to the addition of the yoghurt and I may adapt it with other flavours. Finally the chocolate cigarellos are delicious. They are made from proper quality chocolate and you can tell the difference! Gorgeous photos taken by photographer Terry McNamara – see more beautiful photos of the other delicious treats at the afternoon tea on Good Gobble’s Facebook Page. Be prepared for your mouth to water! I still can’t decide which cake I prefer the look of… So tell me, which cake do you like most? Let me know if your cake makes it into the paper! 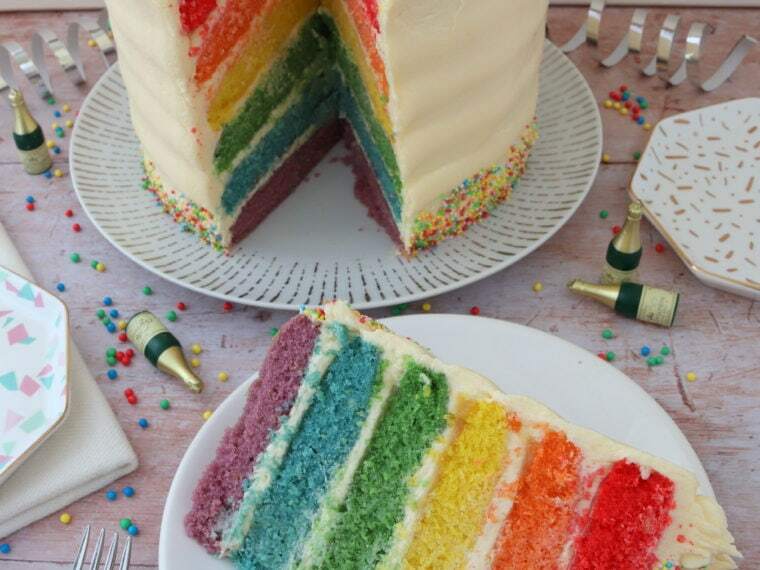 I'm not a fan of rose flavour, but I would be brave and give your gorgeous cake a try!! I will do! I think you might be able to cope with the rose, the raspberries and white choc buttercream compliment it well! I think they both looked stunning but I really liked the taste of those pink cigarillos! Thanks Jules! It was an amazing event you put together! Thank you Kim! 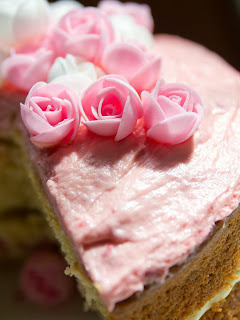 The raspberry buttercream was so good, it was unplanned as well (like many of my kitchen experiments!) I will definitely keep you in mind if I hear of anything. Would recommend following Good Gobble blog and myself so you can keep an eye out too!